Today it is Sunday and Strøget is bit more calm because most shops are closed. Still many tourist and some Copenhageners go there to take a stroll or grab a coffee. This is a perfect day to relax in the sun and to be entertained. Perfect, the show will start in 15 minutes. This is what is written on a small blackboard on the floor of the glass box today, as the shutters go up. 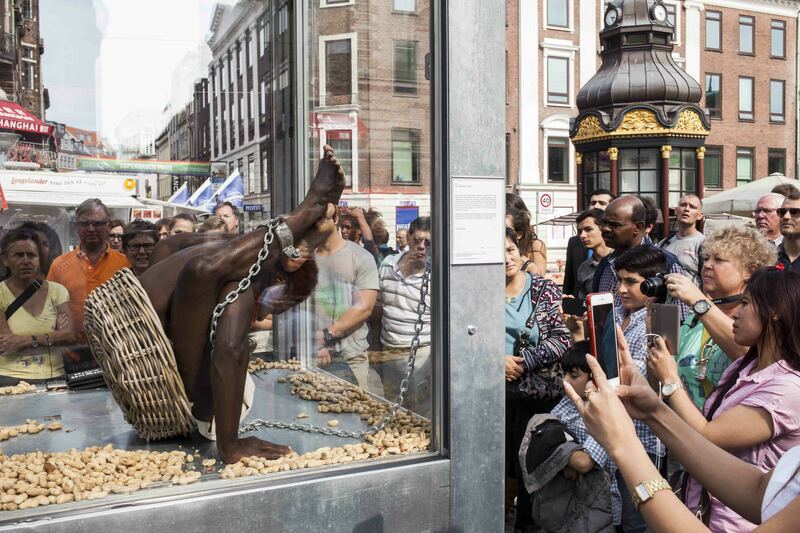 Behind the blackboard is a black man sitting with chains on one of his feet. He wears nothing but a small white cloth around his lower waist. Next to him is a basket filled with peanuts. Some of them are spread on the floor. He looks exhausted while he sits in the corner with his back against the wall eating a few nuts once in a while. One person in the audience is asking one of the others, what this is about. Both of them have been visiting the art installation one of the previous days. staying there for quite some time reading and watching. When the man inside the box looks back at them and keeps looking at them, the mother goes:” I get the shivers, when he looks at me. I feel guilty.” The father replies: “Yeah, it is really a cruel part of our history that we don’t really speak of.” Three young Danish guys are happy to be confronted with this topic: ”It is cool that it is in your face.” Several of the Danish audience talk about the movies “Guldkysten” and “12 Years a Slave”. The last one is portraying the American slave history, which for some Danish people might be more known to them: “I didn’t know Denmark was a part of the slave trade. It is nothing to brag about. You don’t want to see it. When I went to school a long time ago I didn’t learn about that. I thought it was the in the U.S. Well it is good this box is here, so that you can’t miss it.” Some young schoolboys discuss the topic of the installation and refer to their school topic on the former Danish West Indies. A diplomat from Burkino Faso shows interest in the art project. He thinks this art installation is a good idea to create awareness in this time of an increasing nationalist sentiment. The man in the box starts his performance as he stands up and stretches his body. The roar is heard again. He begins to do some extreme acrobatic poses like a contortionist. Many people in the audience grabs their smart phone to record a movie or get at picture. The song “Elefantens vuggevise” (The Elephant’s Lullaby, 1948) is played in the background. It is a popular lullaby, but in the newer versions one line in the song is changed into a more politically correct phrasing. During the day no one is commenting on the song, supposedly because they know it or they are focused on the acrobatic show. One time the audience claps as the shutters go down. 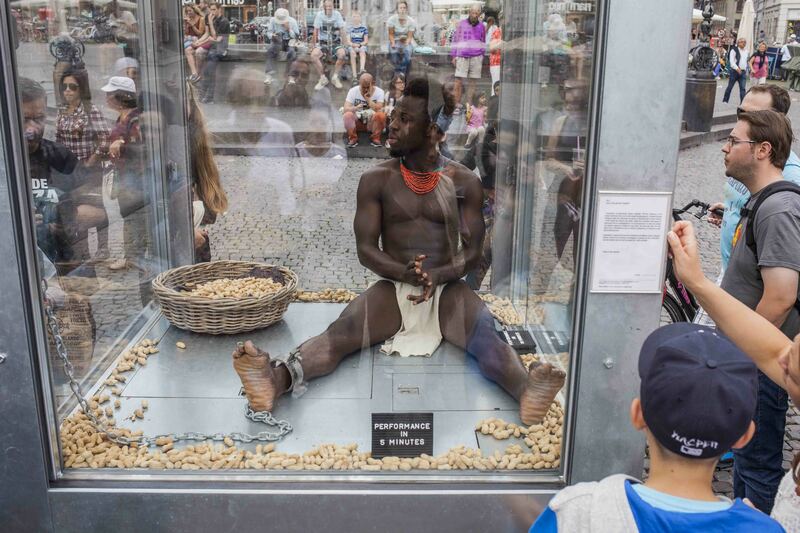 Three people from Gambia arrive just before closing time and see the man lying in the box. It sounds like they are in a good mood, but a bit surprised by the sight: ”Oh my god!” The man goes to read the text of the day on the side of the box. He reads out loud and turns around to some of other people in the audience: “This was what the white man did to us back then. But it was back then”, he smiles to them. The shutters go down. During colonial times, Danish sailors transported 100.000 Africans to the Danish West Indies where they were sold to plantation farmers as their property. Most of these Africans died before arriving because of inadequate conditions on board. In 1848, Denmark abolished slavery. The slaves’ release caused a financial loss for the plantation owners. To compensate for this loss, the Danish government paid fifty dollars for every slave the farmers had owned. An official apology to the Africans or their descendants has not been seen as necessary. The period of colonialism is generally not present in the Danish understanding of national history. This notion is overshadowed by feelings of discomfort about the influence the Danish state had and still has in other places. I kolonitiden transporterede danske sejlskibe 100.000 afrikanere til de Dansk-Vestindiske Øer, hvor de blev solgt til plantageejerne. Flertallet af disse afrikanere døde før ankomsten på grund af utilstrækkelige forhold ombord. I 1848 forbød den danske stat slaveri. Slavernes frisættelse forårsagede et økonomisk tab for plantageejerne. For at kompensere for dette tab betalte den danske regering 50 dollars for hver slave, de havde ejet. Man har ikke anset det for nødvendigt at give en officiel undskyldning til afrikanerne eller deres efterkommere. Kolonitiden er generelt ikke en del af danskernes forståelse af den nationale historie. Denne del af historien overskygges af ubehag ved den indflydelse, som den danske stat har haft og stadig har i andre områder.